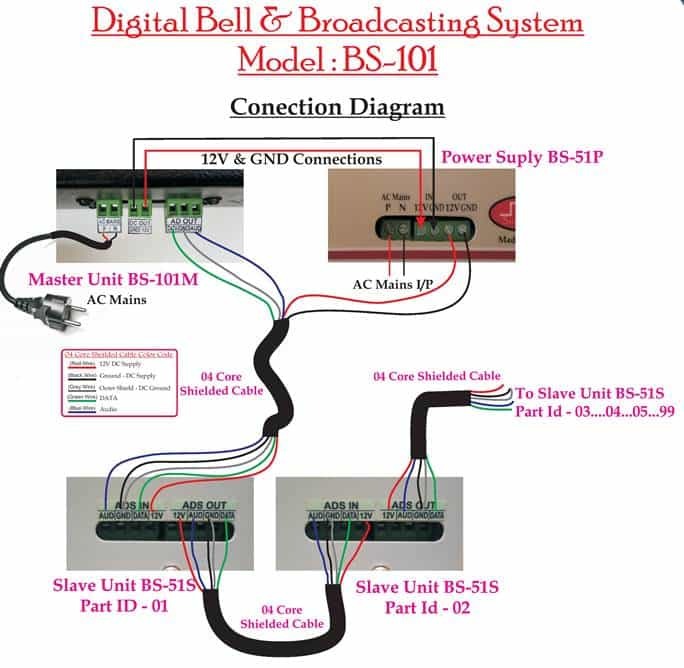 Digital Bell Broadcasting System. 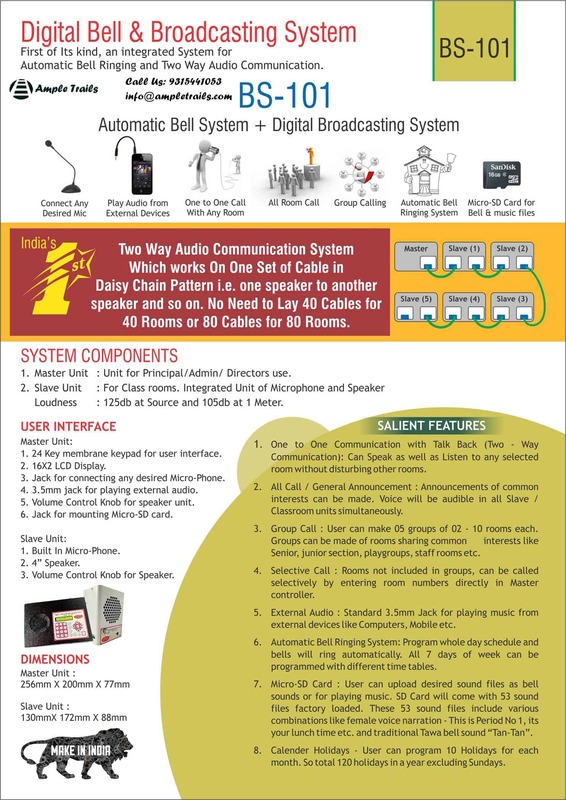 First of Its kind, an integrated System for Automatic Bell Ringing and Two Way Broadcasting in Any Building. School Broadcast System is specially designed for keeping schools requirements in mind. This system is much better then Ahuja School Broadcast System. 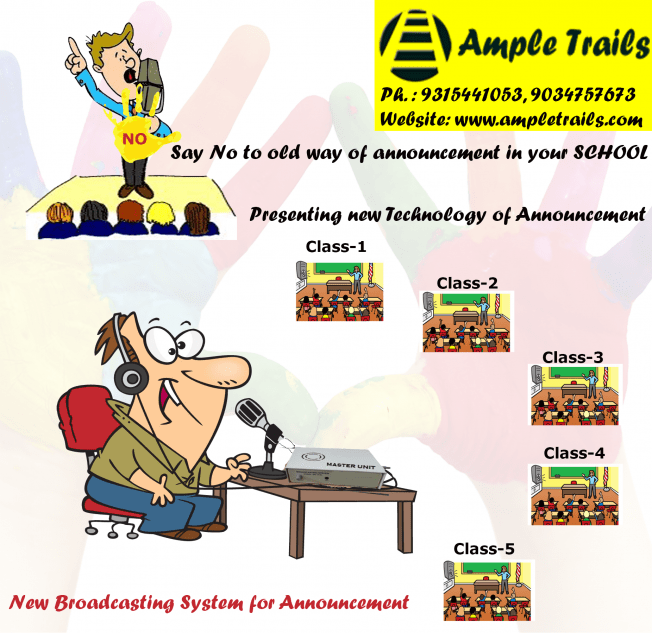 AmpleTrails is providing complete digital school broadcast system. Digital Broadcast System Or School Announcement System Or College Announcement System Or Public Address (PA) System. 1. One to One Communication with Talk Back (Two-Way Communication): Master (Principal/Admin/Directors unit) can speak as well listen to any selected room without disturbing other rooms. 2. All Call / General Announcement: Announcements of common interest can be made using ALL CALL feature. Voice will be audible in all Slave / Classroom units connected with this system. 3. Group Call: User can make 05 groups up to 10 rooms each for making group announcements. Groups can be made of rooms sharing common interests like Senior sections, junior section, playgroups, staff rooms etc..
4. Selective Call: Rooms other than group made, can be called selectively by entering room numbers directly in Master controller. 5. External Audio: 3.5mm Jack is provided at the back of Master controller for playing music from external devices like Desktop, Laptop, Tablet, Mobile etc. 6. 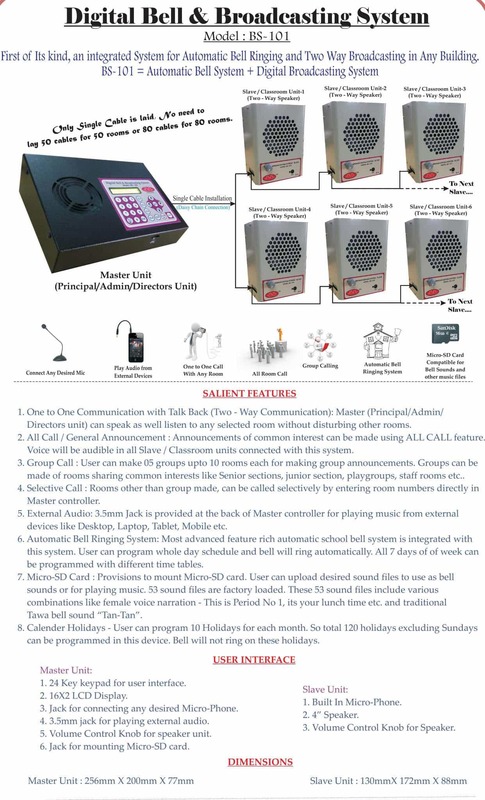 Automatic Bell Ringing System: Most advanced feature rich automatic school bell system is integrated with this system. The user can program whole day schedule and the bell will ring automatically. All 7 days of-of week can be programmed with different timetables. 7. Micro-SD Card: Provisions to mount Micro-SD card. The user can upload desired sound files to use as bell sounds or for playing music. 53 sound files are factory loaded. These 53 sound files include various combinations like female voice narration – This is Period No 1, it’s your lunchtime etc. and traditional Tawa bell sound “Tan-Tan”. 8. Calendar Holidays – User can program 10 Holidays for each month. So total 120 holidays excluding Sundays can be programmed in this device. Bell will not ring on these holidays. It’s an integrated system for the Automatic ringing of School Bell and Two-way communication within a building. School Broadcast System help you in saving time and better management of the school. Broadcasting System for School helps schools in saving lot of money efforts and time. DBS Power Supply BS-51P = 03 to 06 pieces. Warranty of School Broadcast System – 12 months from the date of invoice against all manufacturing defects. Delivery – Generally ready stock, but Kindly contact us before placing an order for exact delivery schedule. 1. 24 Key keypad for user interface. 3. Jack for connecting any desired Micro-Phone. 4. 3.5mm jack for playing external audio. 5. Volume Control Knob for speaker unit. 6. Jack for mounting Micro-SD card. 3. Volume Control Knob for Speaker. The whole system is running only on a single cable so it is very easy to maintain comparing to traditional systems, no efforts are required in this system to manage and maintain a huge bunch of cables. Asks for less space in Administrators cabin. No need to put huge control panels on Administrator’s table.